Slow cooker pot roast recipes can be very convenient for many cooks. Meat has always been the center of my meals as well as my family’s cooking. When I was growing up, Mom either cooked chicken, round steak or pot roast every Sunday. The pot roast was commonly found on many Sunday dinner tables. Although “beef” roast was what most cooked, pork or lamb roast can also be used. During the 1950’s, many of the homemakers took jobs away from home. After the introduction of the first slow cooker many recipes began to appear. By the 1970’s, every home had a slow cooker. I remember the slow cooker pot roast recipes were among the most popular. Delicious and economical meals could be ready for families when people returned home from work. After the first slow cooker was introduced, many others have been designed. They now can be purchased in many sizes (some very small) and styles. Some of the cookers are made with coils running around the sides surrounding the cooking pot. These cook at a constant temperature. The units with the heat in the bottom will go off and on. This can greatly vary the cooking time of the slow cooker pot roast recipes. If you are purchasing a new slow cooker, it is best to buy one with a removable insert. This type is much easier to clean. Today, slow cooker pot roast recipes are very common. Before attempting any of your recipes read your manufacturer’s instructions. There are many advantages to using slow cookers. If you have a busy schedule keeping you out of the kitchen, a meal can be started before leaving the kitchen. This can be a great time saver for slow cooker pot roast recipes for active families. Because of the long slow cooking cheaper cuts of meat can be used turning out delicious pot meals. Slow cooker pot roast recipes are considered to be less dangerous than stove top cooking or in the oven. You certainly WOULD NOT want to leave the house with a roast in the oven or on the stove top. The liquid evaporates with these types of cooking causing the food to burn and eventually catching on fire. Liquid does not evaporated when using slow cookers making them safer. This is why recipes use less liquid than when boiling on stove top. 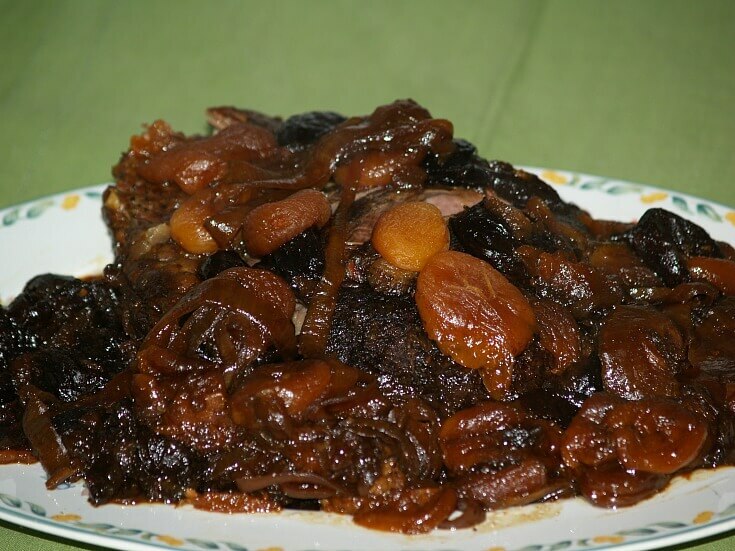 There are a few disadvantages for making slow cooker pot roast recipes. Even though this is low cooking, the food still gets very hot and caution must be taken to prevent spills causing burns. When leaving the pot for hours of cooking, there is a possibility of the power going off while you are away. This happens only on rare occasions in most areas here in the United States but a possibility you must consider. There are some tips you can use to make slow cooker pot roast recipes. Always thaw all frozen vegetables or other ingredients before beginning. Follow your “slow cooker recipes” carefully. The amounts of ingredients are listed for this type of cooking. When adding dairy products do so as close to the end of cooking as possible. After adding allow only enough time to thoroughly heat the ingredients. Very important also is to limit lifting the lid to only when necessary to add ingredients. It takes about 20 minutes to heat back up to previous temperature. By using a few guidelines, regular pot roast recipes can be converted to slow cooker pot roast recipes. Make sure the pot is at least half full but never more than three quarters full. When converting recipes, generally use about half the amount of liquid which a standard pot roast has listed. It is not necessary to brown the roast meat unless you want to cook off extra fat. I actually like the meat better if it is not browned. The crust seems to get too hard compared to the tender meat. If your recipe tells you to use extra fatty meats like bacon for seasoning then this should be browned first. Also remember when converting recipes, spices will become stronger during the long slow cooking. I love spices so this doesn’t bother me but if you prefer milder flavors cut back on the amount added. For all your slow cooker pot roast recipes, you might like to make a gravy or sauce to serve with the roast. Mix a little flour, cornstarch or quick cooking tapioca and a little water to make a paste. Stir this into the liquid left in pot until desired thickness. (For quicker cooking mix paste and juices in saucepan and cook on stove top burner). Sometimes after long hours of cooking, vegetables added to the pot roast will fade the colors. Fresh shredded vegetables or fruits, grated cheese, fresh salsa, herbs or sour cream used as a garnish make a pretty presentation. Sprinkle roast on all sides with seasoning. In skillet brown roast on all sides in heated oil; place roast in slow cooker. On top of roast layer sliced onion, bay leaves, crushed bouillon cubes, minced garlic and mushroom soup. Add wine and enough water to cover all ingredients sufficiently. Cover and cook on low heat for 8 hours or until meat is tender. Make with boneless beef or pork. Sprinkle pork roast with salt and pepper; place in 4 quart slow cooker. Top roast with sliced sweet potatoes and sliced onions. Sprinkle with thyme; pour apple juice over top. Cover and cook over low for 8 hours until pork is tender and no longer pink in center. Combine and blend tomato paste, seasoning, celery, onion, water, vinegar and garlic. Place roast in slow cooker pot; pour blended mixture over the top. Cover with lid; cook over low heat for eight hours or until meat is very tender. Add mushrooms and water chestnuts; cover again and cook until hot. Slice beef and serve over mashed potatoes or cooked noodles; serves 8. 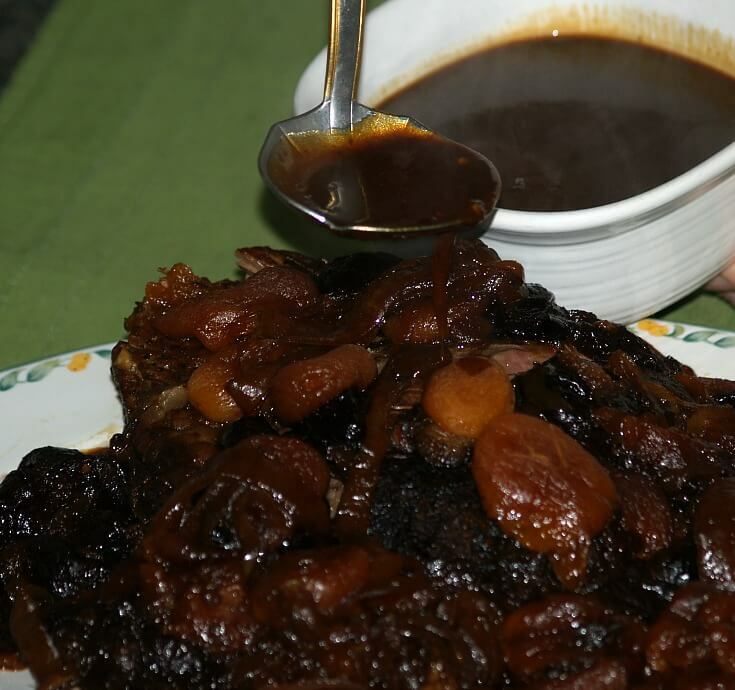 Learn how to make slow cooker pot roast recipe with prunes and apricots. Place sliced onions in bottom of slow cooker; place roast on top of onions. Add apple juice, sugar, salt, pepper, cloves and dried fruit. Cover slow cooker and cook for 8 hours on HIGH until fork tender. Lift meat to a warm serving platter; spoon onions and fruit around meat. Cover platter to keep warm; mix flour and water until smooth. Combine flour mixture with crock dripping and cook until thickened. NOTE: It is faster to thicken sauce over stove top burner on medium high heat; stir constantly. Serve the sauce with meat; serves 8. Place onions in 4 quart slow cooker; place roast on top. Add beer, mustard, caraway seeds, salt and pepper. Cover and cook on HIGH for 8 hours until fork tender. Remove roast and onions; reserve liquid in cooker. Whisk flour into reserved drippings; cook 10 minutes or until thickened. Serve with roast, onions and cooked noodles; serves 6-8.